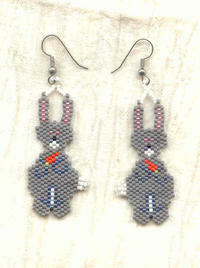 Each tiny glass bead in these buck-toothed bunnies has been individually stitched in place. The result is a lightweight earring that's fun to wear and a sure-fire attention-getter into the bargain. Each earring measures about 2-3/4" from the top of its surgical steel French hook. They're the perfect gift for Easter (naturally) or for the lady born in the Year of the Rabbit ... or for those among us who simply fancy the cuddly little creatures. We're hoppy to oblige, here at SPARKLE PLENTY.